Recently we acquired a “vintage” equipment, rather old but in full working order : it is the Tel-X-Ometer x-ray diffractometer. 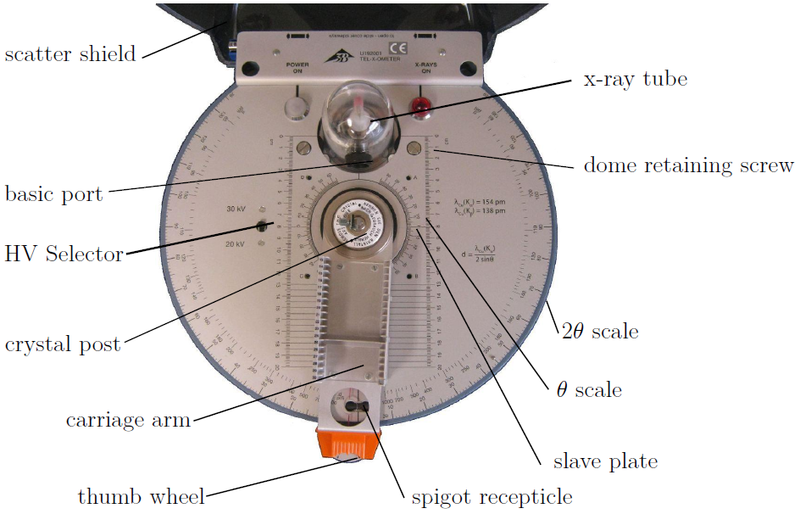 A Tel-X-Ometer is an X-ray diffraction system device which is used to detect the absorption and reflection of X-rays i.e. a spectrometer. The device employs an X-ray tube with copper anode to produce X-rays . 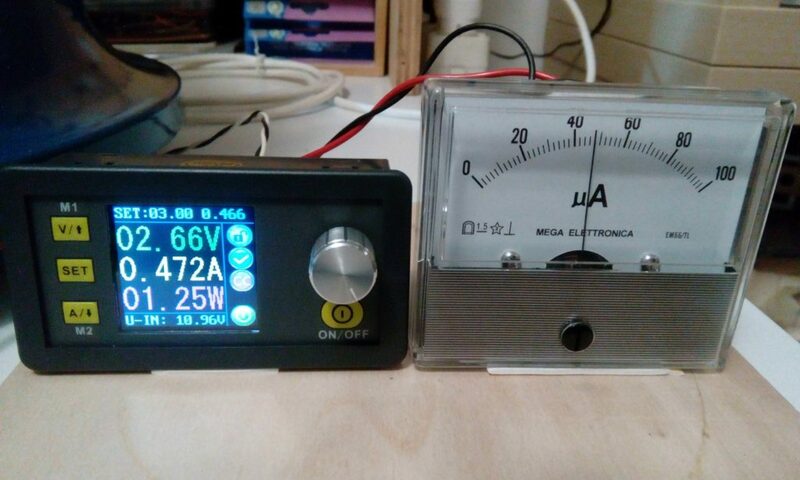 The Tel-X-Ometer has two settings for high voltage : 20 KV and 30 KV. The filament current could also be adjusted, in order to vary the anode current from 20 μA to a maximum value of 80 μA, the normal value is 50 μA. The device allows crystal to be mounted in the center of the device to reflect the X-rays for detection. It also allows numerous collimator slides and filters to be mounted at different numbered positions on a carriage arm assembly. The image below shows the equipment with the main parts. 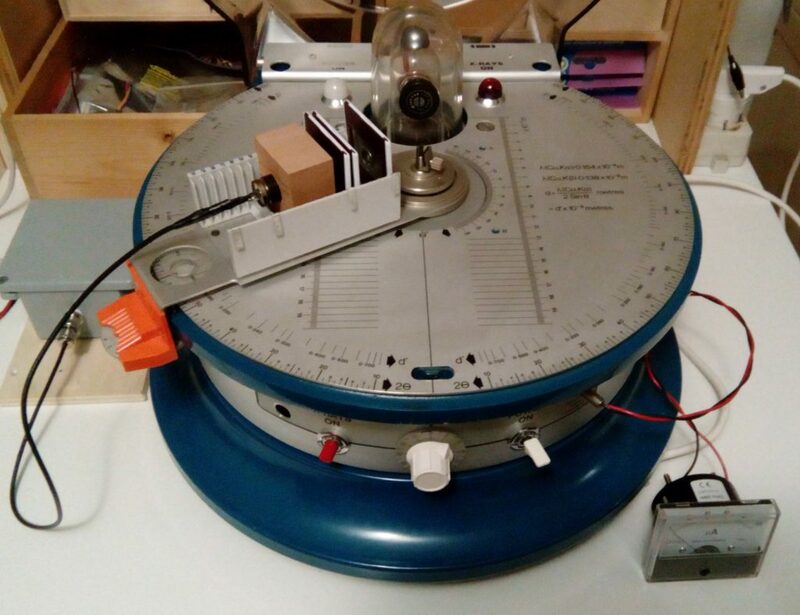 The base of the device has the degree scale of angles, like a large protractor, covering the entire 360° circular base. The carriage arm’s minimum setting is at 12° to a maximum of 124° at each side. 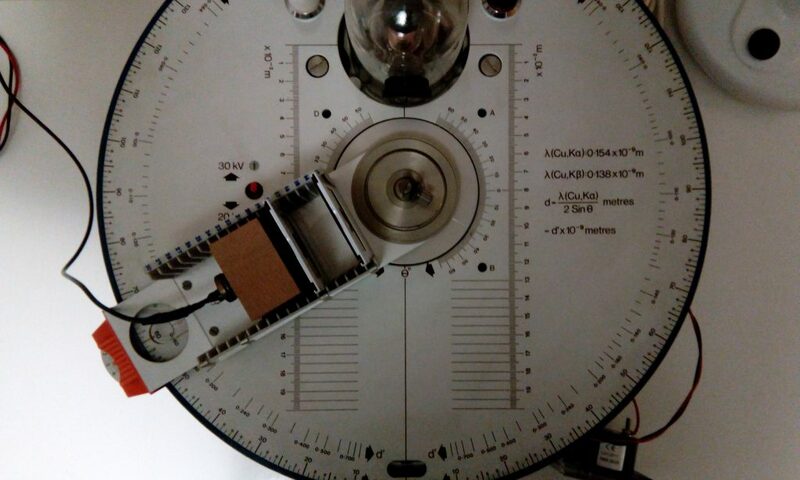 Due to the limited sensitivity of this scale, with the smallest interval being 1°, the carriage arm also has a miniature scale at its tip that can be operated and finely calibrated accordingly by a thumb-wheel. This has a higher sensitivity, with the smallest interval being 10′. A Geiger counter has been mounted at the end of the carriage arm which can be moved around the device from a fixed pivot point at the center, allowing it to be placed at various scattering angles. In accordance with Bragg’s law, the mounted crystal in the center rotates to an incident angle θ when the arm rotates at a angle 2θ. This 1:2 ratio of the angular displacement is maintained by gears at the central pivot point. scattered radiation. There is also a lead backstop on the cover to absorb direct beam rays. For safety reasons the shield must be closed and locked in order to enable X-Rays emission. 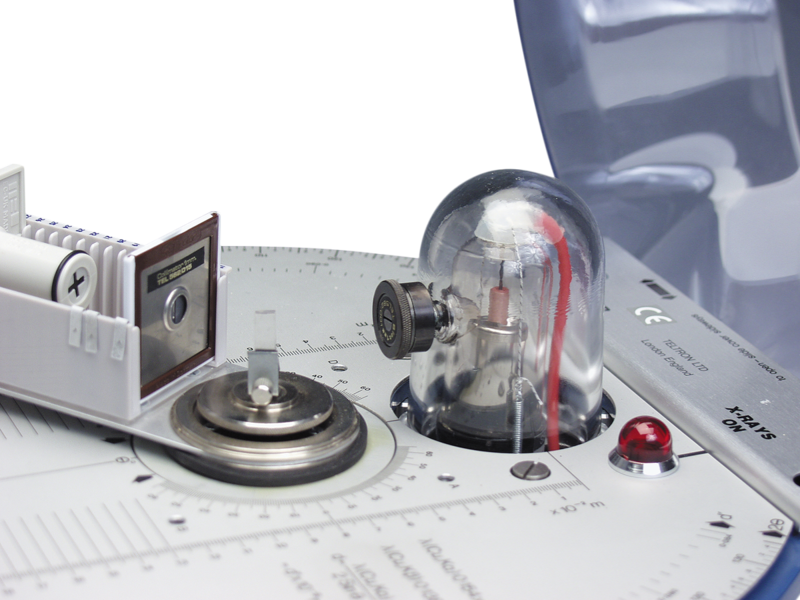 The x-ray tube is mounted inside a transparent lead-glass dome, which absorbs x-rays except for those that will pass through the port to the experimental zone. On the front panel there is an electrical timer knob, which varies from 0-55 min. The filament cannot be turned on unless the timer is set. 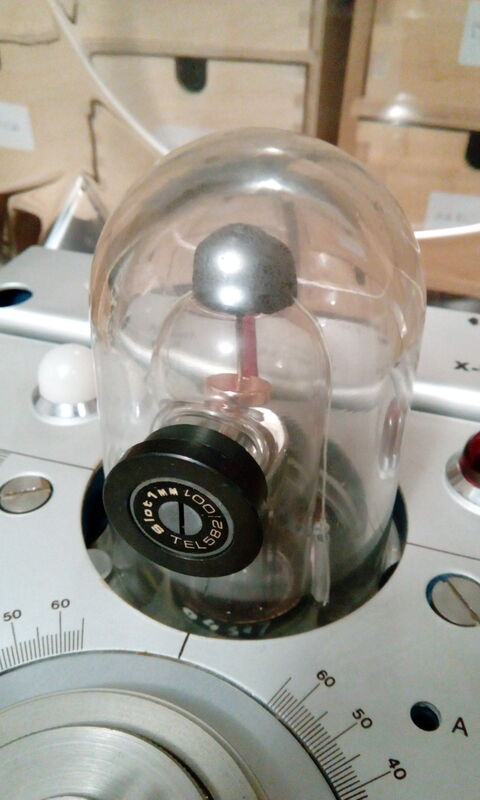 There is also the main switch and the push button to energize the x-ray tube. The two bulbs on the main plate signals the power-on and the x-ray on state. 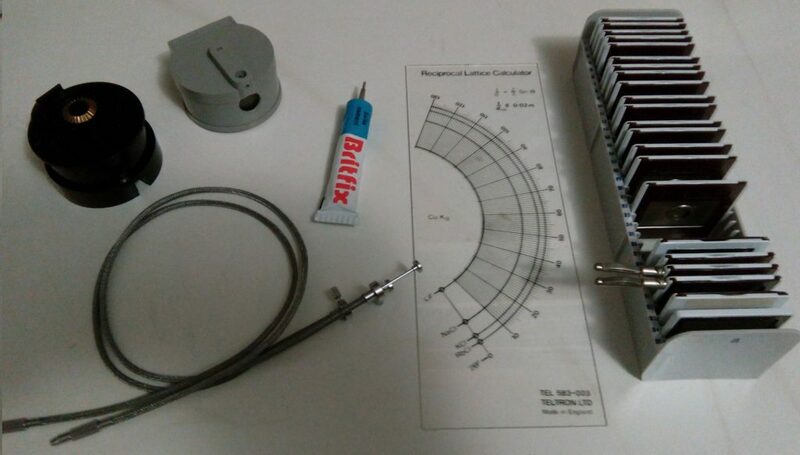 The images below shows the instrument, with the geiger counter inside the wood block and a μ-ammeter to measure the anode current. 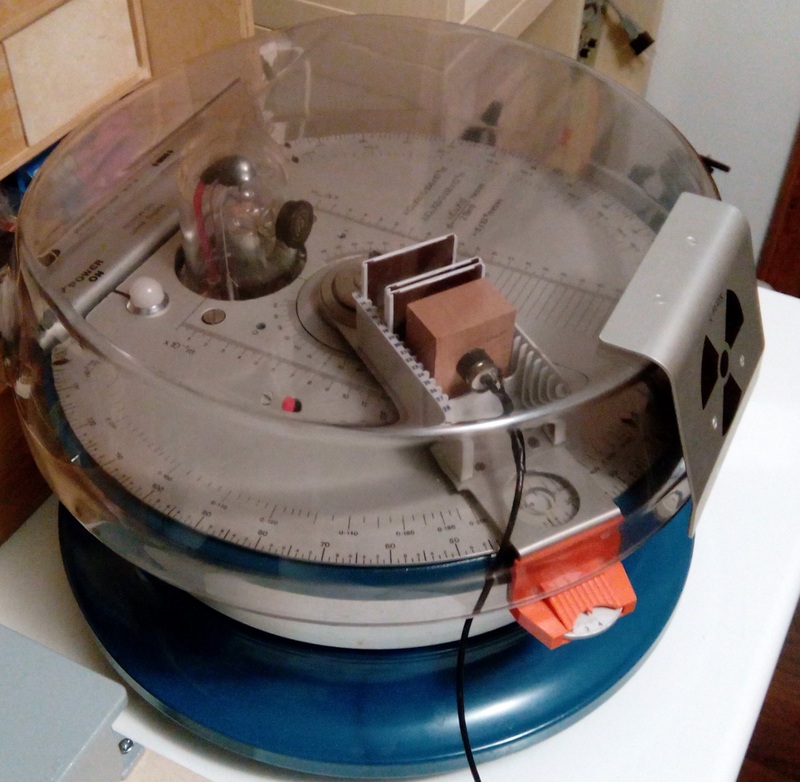 The geiger detector is a LND712 GM tube, connected to a Theremino System (Geiger Adapter plus Theremino Geiger application). In the image above the driver for the filament, showing 0.472 A, and the micro-ammeter for the anodic current. For diffraction experiments the primary x-ray beam has to be collimated, the image below shows the x-ray tube inside the lead-glass dome with the 1mm-slit collimator mounted. For diffraction the slit has to be mounted vertically. There is also another 1mm-hole collimator which is intended to be used in Laue diffraction experiments. The image below shows the detail of the thumb-wheel for fine control. 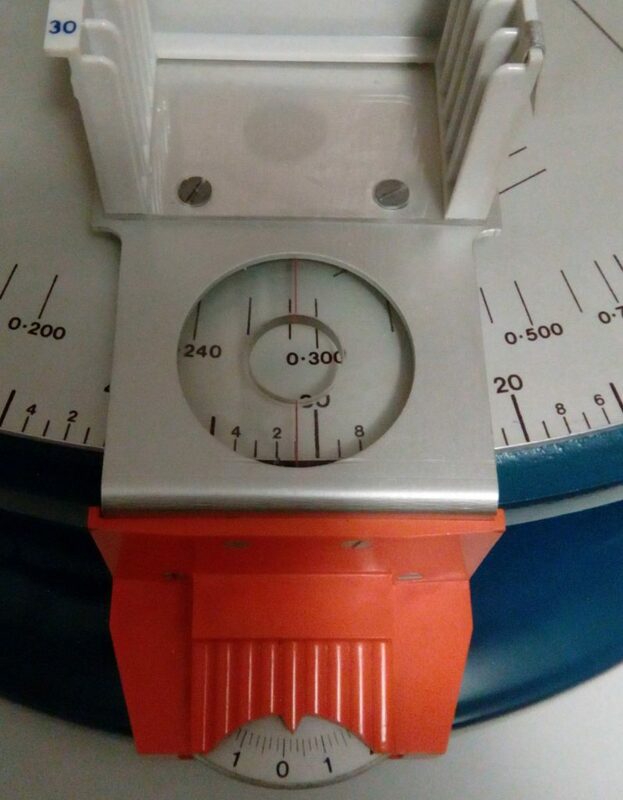 The Carriage Arm is terminated outside the Shield with an orange plastics Manual Control; measurements can be made at the cursor to an accuracy of 10 minutes of arc. To achieve fine adjustment of the Carriage Arm, rest the hand on the base flange of the equipment or on the bench top and using the thumb rotate the knurled aluminium drive wheel protruding from the Manual Control. The emission of the X-Ray tube has been checked with the XRF spectrometer (described in the post DIY XRF Spectrometry). The chart below shows the spectrum acquired with our DIY detector, based on a thin CsI(Tl) scintillator crystal coupled to a PMT. 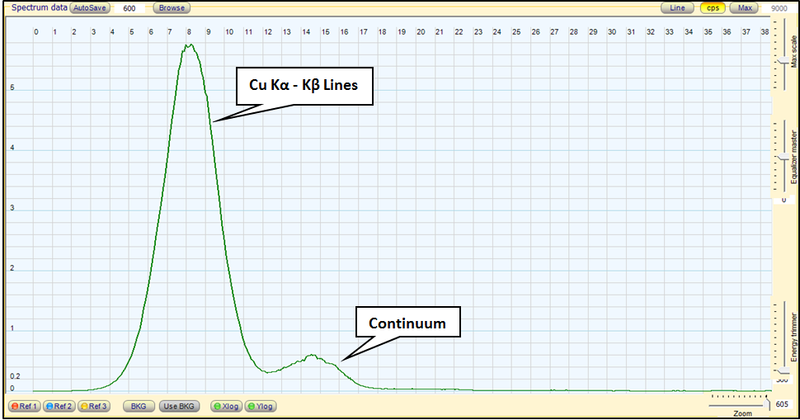 Energized at 30 KV the copper-anode X-Ray tube generates a strong emission around 8 KeV, which are the characteristic Kα and Kβ lines of copper, above a continuum that reach, more or less, the maximum anode voltage. The equipment has arrived with a rich set of accessories. 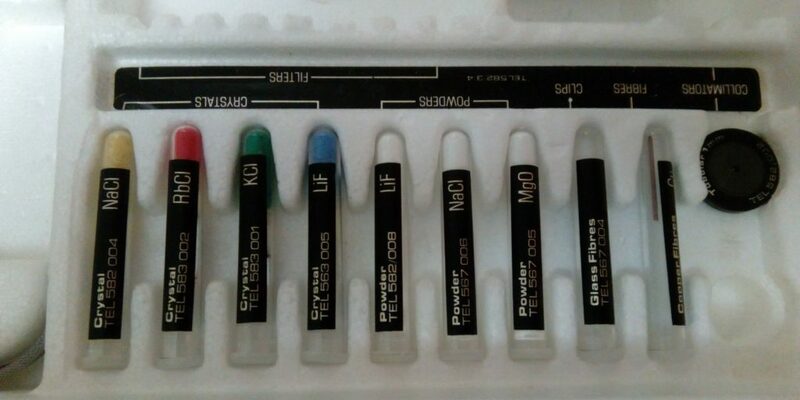 First of all there are four single crystals to perform diffraction experiments : LiF, NaCl, KCl, RbCl; there are three sets of powder : LiF, NaCl and MgO to perform powder diffraction. There are also fibers, clips and collimators. The image below shows these accessories. There are also a Debye-Scherrer chamber, a reciprocal lattice calculator and a full set of filters and collimators to perform various activities on x-rays, as shown in the image below.